According to calculations based on All India Consumer Price Index for Industrial Workers, IDA is to be increased w.e.f. 1.1.2016 by 4.5% for CPSEs where last pay revision was implemented w.e.f. 1.1.2007 and by 7.6% where last pay revision was implemented w.e.f. 1.1.1997. Ujjain Branch (Madhya Pradesh State) of AIBSNLRERA held its conference on 21.11.2015 and unanimously elected a new set of office bears as follows:- President: Shri K.N. Gupta, Vice President: Shri S.C.Pandey, Branch Secretary: Shri S.R.Pharkya, Asst. Branch Secretary: Shri P.N. Parmar, Finance Secretary: Shri B.C. Kulmi, Executive Committee Members: S/Shri N Dave, C.L. Pawar, P.R. Verma, G.K. Pathan and U.S Khatri. Shri Ram Gopal Bajpai, Retd SDE, born on 12.01.1947 and a life member of AIBSNLREA Kanpur Branch (UP State), has been declared winner of second Dan Black Belt by Taekwonda Federation of India on 30.11.2015 which is affiliated to World Taekwonda, headquartered in South Korea. Congratulations! A renewed disinformation campaign seems to have again started to establish that the pension of the BSNL pensioners is not secure. An article titled “Known and Unknown facts” to establish this is doing round the corner for the last few months. Following this, we have also received many queries from some disturbed BSNL pensioners. This is not a new development. Earlier also such campaign was launched and we had to counter the same with hard facts. Our Joint Secretary (South) Shri S Ratnasubramanian has again come out with a write-up based on rules and facts on the issue which outrightly rejects the theory that the pension of BSNL pensioners is not secure. His write-up titled as “Is our pension secure ?” is now available at the left column of this main page. Gujarat State Branch of AIBSNLREA held its GB meeting and Diwali get together on 16-12-2015 at Ahmedabad Medical Association Hall in Ahmedabad. The meeting started with lightening of lamp followed by prayer by Shri B.C.Chauhan. President Shri P.B.Parmar welcomed all the participants, and informed about the activities of the Association during last six months. The House observed silence in memories of flood victims of Taminadu and also the departed members and family members of the Association [Please click State News page of this site and go to the Gujarat State section to read the full report]. In a meeting of the retired BSNL Executives of Sangrur SSA held on 08.12.2015, a new branch of AIBSNLREA has been formed at Sangrur (Punjab). Seven members had attended the meeting. The members had expressed their anxiety due to non-settlement of revision of pension with the fitment benefit of merger 78.2% IDA. Shri P K Jindal, who was elected as Branch President, apprised the members about the actions taken by the CHQ to settle various problems of BSNL pensioners. The Meeting also unanimously elected the following office bearers:- Branch President: Shri P K Jindal, Retd DGM, Vice President: Shri Resham Lal, Retd DGM, Branch Secretary: Shri Gurmail Singh, Retd SDE, Asst. Branch Secretary: Shri Didar Singh, Retd SDE, Financial Secretary: Shri V K Mittal, Retd AGM, Organizing Secretary: Shri B S Sidhu, Retd DET. The meeting ended with vote of thanks to all the members and office bearers. On 5.11.2015 we had reported in this site that "DOT has decided to send the final Cabinet Note on the above issue to the Cabinet Secretariat by addressing the points raised in DOE’s reply to DOT’s draft Cabinet Note which was earlier sent to all concerned Ministries/Departments including DOE for their comments/views. The points will be addressed in the Cabinet Note itself." It is now learnt that the cabinet note has been finalised, incorporating a few suggestions by PSE section of DoT and is likely to be submitted to the Cabinet Secretariat next week. A letter will simultaneously be sent to DoE replying to the queries earlier raised by it, as have been included in the final cabinet note. Nature let out its worst fury, as unprecedented heavy rains pounded Chennai and surrounding areas leaving the areas amidst worst floods ever recorded, as more than 250 people have died and 2 million people were stranded without power, water and food. Train services came to a halt and the Chennai Airport was closed. Communication networks failed leaving friends and relatives in a quandary. Rain has now stopped and Chennai is limping back slowly to normalcy. Rehabilitation measures have commenced, with the Government of Tamilnadu estimating the cost at 20000 crores. Business houses, NGOs, Social Institutions and individuals are pitching in with assistance to the flood victims. We request all our members to contribute towards rehabilitation of the affected people in Chennai by sending either cash or cheque or Demand Draft drawn in favour of "CHIEF MINISTER'S PUBLIC RELIEF FUND" addressed to : The Joint Secretary to Government and Treasurer, Chief Minister's Public Relief Fund, Finance Department, Secretariat, Chennai-600 009. Alternately, contribution can also be sent to Prime Minister's National Relief Fund either through Nationalised Banks, Netbanking or online at pmnrf.gov.in. December 2015 issue of AIBSNLREA E-journal has been uploaded and is available under the link "E-Journal" in the left column. A General Body Meeting of AIBSNLREA, West Bengal State Branch will be held on Thursday, at 13.00 hours of 10th December 2015 at the CTO Building Telecom Hall, Kolkata to discuss about the problems of the pensioners and their status, other important issues and organizational activities. Wall Calendar for the year 2016 will also be distributed among the members. All the members of the Association and other retired executives of BSNL are requested to attend the meeting. A new Branch of AIBSNLREA has been formed at Wardha in Maharashtra. The meeting was held at 11.00 hours of 3rd November 2015 in Swadhyay Mandir Wardha. Ten members have already enrolled as Life members of the Association. S/Shri S.K.Patankar and G.S.Kawley were elected as the Branch President and Branch Secretary respectively. Shri A.A.Chawade is the Finance Secretary of the Branch. The Principal CCA, Maharashtra Circle, Mumbai has notified to hold a Pension Adalat on 23.12.2015 for redressal of grievances of the employees retired from BSNL and DOT from Amravati, Nagpur, Akola, Yavatmal, Buldana, Khargaon, Wardha, Bhandara, Chandrapur and Ghatcharoli SSAs. The Adalat will be held at Amravati. AIBSNLREA Akola (MH) Branch held its bi-monthly General Body meeting on 18-11-2015 at the residence of Shri P.P. Chimankar Retd. A.O. Akola. Twenty one (21) members were present in the meeting and three new Life Members were also enrolled in the Branch. After enrollment of these members, the membership of Akola branch has increased to 52 members. Shri A.G. Nema Branch Secretary welcomed all the members including the new members. Two minutes silence was first observed to convey condolence to the departed souls of Vice President Late Shri P.T. Kolhe retired D.E. and his wife Late Smt. Kamal Prabhakar Kolhe who expired on 26th September and 24th October 2015 respectively. Branch Secretary apprised about the latest information regarding the case of merger of 50% I.D.A. effectively amounting to 78.2%. The members condemned the long delay in this matter. Branch Secretary highlighted the importance of the Association and urged the house to help in enrollment of new retired executives. The meeting was adjourned with vote of thanks. In order to consider the requests received from all corners, BSNL Corporate Office wanted to examine the above issue and had asked the CGMs to send information about the (i) total number of retired employees availing medical facility and (ii) total Outdoor expenditure incurred during the financial years 2012-13, 2013-14 and 2014-15 vide its letter No. BSNL/Admn.I/15-22/14 dated 17.03.2015. Thereafter, since information was received only from five Circles, the Corporate Office issued a reminder vide its No. BSNL/Admn.I/15-22/14 dated 23.04.2015 to all the circles. So far out of the 48 Circles, complete information has been received only from 22 Circles, while another Circle i.e. Haryana has sent only partial information. Another 25 Circles are yet to send the requested information. These Circles are: A&N, Andhra Pradesh, Assam, Bihar, Himachal Pradesh, Jharkhand, Jammu & Kashmir, Karnataka, Kerala, North East I, North East II, Orissa, Punjab, Kolkata Telephones, Uttaranchal, West Bengal, BRBRAITT, BBNW, ETP, ETR, IT Project, NTP, NTR, Inspection and TF Kolkata. We now request for the help of our members and other interested individual retired employees and the concerned unions and associations to prevail over the defaulting Circles and expedite supply of the information as requested in the above quoted BSNL letters to get the case examined and a decision taken at the earliest. In continuation of the posting dated 16.11.2015 in this website on the above issue, it is informed that the proposed holding of Pension Adalat has now been postponed to 29.12.2015 and the date for submission of grievances for redressal has been extended to 4.12.2015. The venue, however, remains unchanged. Kanpur Branch (UP State) of AIBSNLREA had a General Body meeting in the TRC Hall, Kanpur Telephone Exchange Main Building on 05.11.2015. Shri R S Arora, State Secretary attended and addressed the meeting. Afterwards, a new set of office bearers was unanimously elected with S/Shri Dharam Das as President, S B Saini as the Branch Secretary and Lal Singh as Branch Finance Secretary. In an interesting development, for the first time after so many years of continuous losses, BSNL has started to move on the path of economic recovery. BSNL has recorded an operative profit of Rs 672crores for the year 2014-15 as against the operating loss of Rs 692 crores during 2013-14. The Company is expected to have net profit from the year 2019. CMD, BSNL has broken this newsto the newsmen. This turn around by BSNL is very significant and may inspire the employees to give their best so that BSNL starts earning net profit even earlier to the date as expected by the Management. Media has reported that the 7th Central Pay Commission constituted by the Government for giving recommendations on pay and allowances of the CG Employees and revision of pension of retired CG employees, besides other issues, may submit its report on 20th November 2015. The recommendations of CPC will not have any direct impact on the employees of CPSEs for whom a separate Pay Revision Committee has to be constituted. However, any benefit coming out of any possible changes in the CCS (Pension) Rules, 1972 will be applicable to the absorbed BSNL pensioners. Controller of Communication Accounts, Gujarat Telecom Region is holding Pension Adalat on 15.12.2015 for redressal of grievances of the employees retired from BSNL and DOT from Vadodara, Godhra, Bharuch and Nanded SSAs of Gujarat Telecom Circle. The concerned retired employees may send their grievances to Assistant Controller of Communication Accounts, o/o Controller of Communication Accounts, Gujarat Telecom Region, 7th Floor, P&T Administrative Building, Khanpur, Ahmedabad -380001 so as to reach the same on or before 23.11.2015. For further details, the Assistant. CCA be contacted on phone No. 079-25510050. Government of India is considering a proposal for introduction of Health Insurance Scheme for the employees and pensioners including those residing in non-CGHS areas. It has already prepared a proposal in consultation with NITI Ayog, Department of Expenditure, Department of Financial Services and the Insurance Companies. An EFC Note in this regard is being sent to all concerned Departments to get their response. November 2015 issue of AIBSNLREA E-journal has been uploaded and is available under the link "E-Journal" in the left column. As we have been given to understand, DOT has decided to send the final Cabinet Note on the above issue to the Cabinet Secretariat by addressing the points raised in DOE’s reply to DOT’s draft Cabinet Note which was earlier sent to all concerned Ministries/Departments including DOE for their comments/views. The points will be addressed in the Cabinet Note itself. Accordingly, a draf proposal was submitted and now the competent authority has advised to submit the fair copy of the same and process the file for submission to MOC&IT for his approval. If no other new points are raised, it is expected that the final Cabinet Note will be sent to the Cabinet Secretariat, hopefully before this month end. It may, however, be noted that in the meeting of SCOVA held on 13.10.2015, DOP&PW had advised DOT to reply the queries raised by DOE by 31.10.2015. All pensioners will be required to submit their Life Certificate in November 2015. Life Certificate can be submitted in newly introduced Aadhar based digital Life Certificate system or old system of filling up a prescribed form. Pensioners may contact their concerned pension disbursing banks/Post Offices as the case may be. A general body meeting of Ambala Branch (Haryana State) was held on 25.10.2015 under the chairmanship of Shri P C Chauhan to elect a new set of office bearers since the existing body had completed its tenure. 23 members of the branch attended the meeting. Branch Secretary briefed the members about the achievements of the branch in resolving the issues relating to the members. He also discussed about the latest status of 78.2% DA merger case for which the members expressed their deep anguish over the delay in settling the issue by DOT and BSNL in spite of all best efforts by all the pensioners associations. Financial Secretary placed the Statement of Accounts of the Branch in the house which was adopted unanimously. A new set of officer bearers of the Branch was later elected unanimously with Shri P C Chauhan as the Branch President, Shri J C Gupta as Branch Secretary and Shri K C Pandwar as Financial Secretary. 27th meeting of Standing Committee of Voluntary Agencies (SCOVA) was held on 13.10.2015 as scheduled. Three specific issues of importance for the absorbed BSNL pensioners were also discussed in the meeting. The status of these issues as available before this meeting and given in the Action Taken Report (ATR) circulated by DOP&PW was duly uploaded in this website on 08.10.2013. However, confirmed information on the latest status and decisions taken in the said meeting on these issues are not available. This can be known only when the official minutes of the discussions is issued. We cannot confirm the authenticity of the reporting’s by others, since on the last occasion such reports were found to be totally misplaced. It was earlier reported that after due scrutiny of the draft cabinet note sent by DOT, Department of Expenditure raised some queries. Thereafter, Establishment Branch of DOT had re-submitted the file and the Internal Finance Unit of DOT, on their own, collected certain information which are required for the purpose from all the CCAs. The Establishment Branch, after doing the needful, had again re-submitted the case. The issue is reported to be getting sorted out. The Annual General Body Meeting of All India Bharat Sanchar Nigam Limited Retired Executives’ Association, Dharwad District (Hubli) Branch, Karnataka was held on Saturday the 3rd October 2015 at the Conference Hall, BSNL Sadan in the premises of GMTD, Hubli. Shri B G Kanavi, President chaired the meeting. Shri A. S. Parwatikar, Branch Secretary welcomed the members and addressed the gathering. There were discussions mainly on merger of 50% of DA effectively amounting to 78.2% for fitment benefit in the revised IDA pay scales and other issues. He highlighted the current issues taken up by CHQ in the interest of pensioners. Various correspondences made by GS, CHQ AIBSNLREA on pension/family pension revision and medical facilities, etc were mainly highlighted and appreciated by all the members. All the members expressed that General Secretary AIBSNLREA should take up the matter of 78.2% on war footing so that at this stage it will not be delayed for any kind of reasons by the authorities. Also a resolution was passed to communicate to the GMTD HUBLI and also CGMT Bangalore for empanelment of good and reputed hospitals for the purpose of BSNLMRS facility at Hubli-Dharwad. About 65 members participated in the meeting. Shri V.V.Katti, Financial Secretary read out the finance statement. Shri B G Kanavi, President addressed the members and highlighted the recent developments as regards to the retired BSNL officers. Shri G B Angadi highlighted the recent developments as regards 78.2% issue. The election of office bearers for the period 2015-16 was on the agenda. The house unanimously passed the resolution that the existing body should continue. The same was adopted. Ten new retired officers were enrolled in the meeting and were extended warm welcome by all other members of the association, Hubli Branch. Shri N K Gandhigawad, who retired as DGM, Hubli last month, joined our association and enlightened members regarding latest developments in BSNL. The meeting ended with vote of thanks to the chair and members by Shri G B Angadi. Quarterly General Body meeting of Lucknow Branch (UP State) was held on 9-10-2015 in the Recreation Club at the Telephone Exchange campus, Kaiserbagh. 58 members attended the meeting. Four new life members also got enrolled. Members expressed their resentment due to abnormal delay in settlement of 78.2% ida merger issue and pay anomaly cases [ For full text of the Report, please view the Uttar Pradesh Section of State News Page of this website]. Quarterly General body meeting of AIBSNLREA, East Godavari District Branch was held on 15-10-2015 at RL GRAND Hotel, Kakinada under the president ship of Shri GV Rama Krishna. Meeting started with the prayer by Shri KS Prakasha Rao. Shri GSVSS Vara Prasad, District Secretary welcomed the members [Please view the Andhra Pradesh State Section of State News Page of this website to read the full Report]. October 2015 issue of AIBSNLREA E-journal has been uploaded and is available under the link "E-Journal" in the left column. According to calculations based on All India Consumer Price Index for Industrial Workers, IDA is to be increased w.e.f. 1.10.2015 by 5.3% for CPSEs where last pay revision was implemented w.e.f. 1.1.2007 and by 8.9% where last pay revision was implemented w.e.f. 1.1.1997. Department of Telecommunications (Establishment Branch) is yet to prepare the final Cabinet Note on pension revision since it is yet to obtain the views/comments of Department of Expenditure on its draft Cabinet Note. In fact, DOT is yet to send the reply to the queries that were raised by Department of Expenditure on its draft Cabinet Note. The draft for the reply to be sent to DOE was submitted to Internal Finance by the Establishment Branch and the Internal Finance Unit is now said to be giving its response shortly which will enable Establishment Branch to send the reply to DOE. The later will only then give its much needed views/comments to DOT. A general body meeting of Ambala Branch (Haryana) of AIBSNLREA was held on 10.9.2015 under the chairmanship of Sh. P C Chauhan. 26 members participated in the meeting. Shri J. C Gupta Branch Secretary addressed the meeting and updated the members on various issues confronting the members. The members expressed their anguish over the abnormal delay on the fixation of pay of retirees with merger of 78.2% DA . The members also expressed their concern over the non-payment of medical bills in Haryana Circle since April 2015. It was further decided in the meeting to hold elections of the branch in the next meeting as the present body has completed its tenure of two years. One new member has joined the Association as life member. Palakkad Branch held a General Body meeting at Top in Town conference hall at Palakkad on 8.9.15. Meeting started at 11am. 36 members were present. 3 new members have joined the branch and the present strength has reached 63. There were elaborate discussions on various topics related to pensioners especially OROP and the highly belated and unsettled 78.2 % ida merger issue. All the members were in an agitated mood. Majority of them opined for approaching the court of law. Thereafter the meeting was concluded and the members disbursed after lunch at 1400 hrs. Department of Pension & Pensioners’ Welfare, in an office circular issued on 7 th September 2015, has informed that the 27th Meeting of Standing Committee of Voluntary Agencies(SCOVA) which was earlier scheduled to be held on 29th September 2015 has been postponed. Revised date and time to hold the meeting will be announced later. Responding to the appeal made by the CHQ of AIBSNLREA, its West Bengal State Branch collected nearly Rs.50,000 from its members for the relief operations for the earth quake victims in Nepal and remitted the said amount (Rs 50,000/-) to the Prime Minister’s National Relief Fund. PMO has acknowledged the same and appreciated the gesture. A good initiative for a noble cause. September 2015 issue of AIBSNLREA E-journal has been uploaded and is available under the link "E-Journal" in the left column. 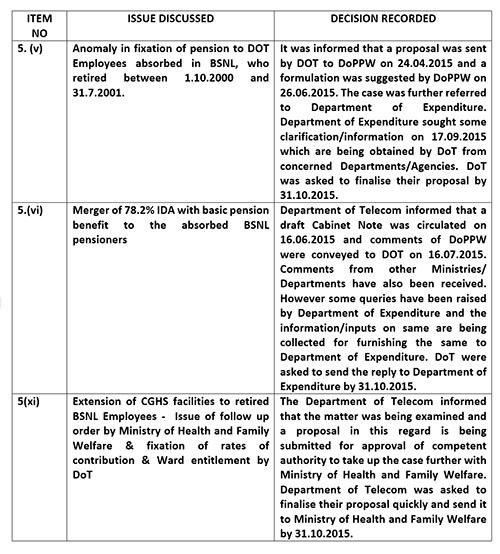 In continuation to our last posting dated 19.08.2015 in this website on the above issue, it is to report that Internal Finance Unit of DOT has examined the contents of the reply to be sent by the Establishment Branch of Department of Telecommunications to the Department of Expenditure in response to their queries. The file has already been submitted to the senior Officers of Internal Finance. Smt Sumita Purkayastha, Principal CCA, New Delhi held a meeting of the pensioners at Varanasi on 25.08.2015 in connection with introduction of Pension Distribution Authority System in Varanasi. Discussions were also held on the pensionary benefits. S/Shri K P Singh, GeneralManager, Varanasi, U B Tiwari, Controller of Communications Accounts, UP(East) and the concerned Accounts Officers from both UP(E) Telecom Circle Office and Varanasi Telecom District were present in the meeting. Forty members from AIBSNLREA, Varanasi Branch attended the meeting. Department of Pension & Pensioners’ Welfare has since notified that the 27th Meeting of Standing Committee of Voluntary Agencies (SCOVA) will be held shortly. It will notify the date, time and venue of the meeting in due course of time. We are proposing to hold our All India Conference at Ahmedabad in December 2015/January 2016. In this regard, we have mailed a circular letter to the branches and others at their e-mail ids available with us. Those who have not received the same may mail us giving their e-mail ids. Sometime back, CHQ had requested all Branches to mail us the e-mail ids of the President, Secretary and Finance Secretary of the Branches. Unfortunately, many of the branches did not respond. All such branches are again requested to do the needful at the earliest. The Notice for the AIC will be issued after receiving the feedback from the branches and making other arrangements. A delegation from West Bengal State Branch of AIBSNLREA, comprising of President, State Secretary, Vice President ex President Sri A K Basuroy, met the new CGMCalcutta Telephones on 18.08.2015 and welcomed him. They also handed over a list of unsettled long pending deferred option cases of the Executives and requested for his personal intervention for their early settlement. It has also been informed by the State Secretary that Principal CCA Kolkata has issued a notification through the leading dailies of Kolkata on 12th August 2015 asking for submission of Pensioner’s updated data by the Telecom/BSNL pensioners residing in the State of West Bengal Sikkim. State Branch has already informed the members through SMS and personal contact and distributed copy of the format among the members present in a meeting held on 18th August 2015. BSNL Pensioners in West Bengal and Sikkim, if desired, may contact State Secretary and other Office Bearers of AIBSNLREA, West Bengal State Branch for further details. Department of Telecommunications has received the final views/comments on its proposal on pension revision to prepare the final cabinet note from all the concerned Ministries except Ministry of Finance (Department of Expenditure). Department of Expenditure is stated to have asked for certain clarifications/information which are now being examined by Establishment Branch of DOT in consultation with the Internal Finance. Once this process is over, reply will be sent to Department of Expenditure. This is a routine procedure and nothing more can be attributed to this. Incidentally, Department of Pension & Pensioners’ Welfare has agreed to DoT’s proposal ‘subject to approval by Department of Expenditure’. A bimonthly General Body meeting of AIBSNLREA, Chandigarh Branch will be held on 8th August, 2015 (Saturday) at 2:30 PM at the canteen of General Post office on 2nd Floor, Sector-17, Chandigarh. All are requested to attend the same in time. August 2015 issue of AIBSNLREA E-journal has been uploaded and is available under the link "E-Journal" in the left column. A meeting of AIBSNLREA Erode Branch was held on 25.7.2015 at Hotel Kohinoor, Erode to felicitate Shri C.Krishnan, SDE and Shri S.Mahendran, DGM on the eve of their retirement. ………. [For full report, please view Tamilnadu Section of State News Page of this website]. Department of Telecommunications is still in the process of collecting the views/comments from the concerned Ministries on the proposal contained in its draft cabinet note to extend the proposed benefits to the pre-2007 and post 2007 BSNL pensioners who retired before 10.06.2013. Hopefully, DOT will be able to prepare the final Cabinet Note by August 2015 and process it further. We regret that we could not update our website since for the last five days our internet was not working. We failed to get it restored despite our all out efforts with concerned MTNL authorities. As a result, we even failed to post our homage to Dr A P J Abdul Kalam, Ex-President of India and builder of India’s space technology who expired on 26/07/2015 while delivering a lecture at IIM, Shillong. We once again regret for our failure due to the reasons beyond our control. The bi-annual General Body meeting of AIBSNLREA, East Vidarbha (Nagpur) Branch was held on 11th July, 2015 at Amenity Block, CTO Compound Nagpur under the Chairmanship of Shri N G Talewar President of the Branch. After paying tributes to the departed family members, Shri Arun Deshpande Asst Secretary welcomed all the life members and newly enrolled life members. ………. [For full report, please view Maharashtra Section of State News Page of this website]. AIBSNLREA had already reported (view posting dated 19.06.2015 in this website and also the Editorial in July 2015 issue of its e-journal “Second Innings”) that DOT has circulated the draft cabinet note on its proposal for revision of pension of BSNL pensioners with fitment benefit by merger of 78.2% IDA to all the concerned Ministries to get their comments/views. As we understand, DOT will review the status regarding the response that it might receive from various Ministries immediately after the completion of one month of its sending the draft cabinet note. It may, thereafter, issue reminder to the Ministries concerned from where comments/views would be awaited. However comments/views from DOP&PW, DOE and DPE would only be important, though the DPE may respond but not give any views/comment as it did so when the Cabinet Note for revision of pension of pre-2007 BSNL pensioners was processed following finalization of revision of pay scales of the BSNL employees w.e.f. 1.1.2007. JuLY 2015 issue of AIBSNLREA E-journal has been uploaded and is available under the link "E-Journal" in the left column. East Vidarbha (Nagpur) Branch of AIBSNLREA is to hold its bi-annual General Body Meeting at 4.00 PM on Saturday, the 11th July 2015 at Amenity Hall, CTO Compound, Nagpur. All the members of the Branch and other retired Executives have been invited to attend the meeting. Shri P R Bhujbal, Branch Secretary may be contacted for further details on his mobile No. 9422810810. According to calculations based on All India Consumer Price Index for Industrial Workers, IDA is to be increased w.e.f. 1.7.2015 by 2.1% for CPSEs where last pay revision was implemented w.e.f. 1.1.2007 and by 3.6% where last pay revision was implemented w.e.f. 1.1.1997. AIBSNLREA has been pursuing the above issue for last few years. The issue also became a regular item for discussions in the meetings of SCOVA. In its last meeting held on 03.02.2015, it was recorded in the minutes that “It was informed that since the last SCOVA meeting, two meetings were held with the officials of Department of Telecom on 20.9.2014 and 30.12.2014 and Department of Telecom was advised to expedite the details/Reply sought in DoP&PW’s ID Note dtd 28.02.2014. Department of Telecom informed that the BSNL is collecting the requisite information sought by DoP&PW from corporate offices of BSNL/MTNL. Department of Telecom was advised to send a reply to DOP&PW within a fortnight”. However, DOT was taking its time to prepare and send the reply since the requisite information was being delayed from BSNL. Now it is informed by DOT that the concerned file in which the issue is being dealt has been referred to DOP&PW for a decision on the issue. Ministry of Finance, through a Gazette Notification, has issued the revised Income Tax Forms. Now tax payers can file their returns. The Forms are available in the IT Department’s website. The Establishment Branch of Department of Telecommunications is reported to have circulated the draft cabinet note on its proposal for revision of pension of BSNL pensioners to all the concerned Ministries. The draft note also includes payment of enhanced Gratuity, Commuted Value of Pension and leave encashment on the date of retirement to those who retired after 01.01.2007 but before 10.06.2013. The Establishment Branch of Department of Telecommunications is yet to circulate the draft cabinet note on its proposal for revision of pension of BSNL pensioners to all the concerned Ministries, though the note already stands approved by Internal Finance and other competent authorities as was reported earlier in this website. It is expected that the same may be sent to all concerned Ministries by early next week. In continuation of the information that was given in this website on 05.06.2015, it is now to confirm that the draft cabinet note for revision of pension with revised fitment benefit by merger of 78.2% DA, in respect of pre-2007 BSNL pensioners and the retirees who retired between 1.1.2007 and 9.6.2013, has been approved by the competent authority for circulation to all the concerned Ministries to seek for their views. Establishment Branch of DOT is expected to circulate the same in a few days time. DOT has to finalize the Cabinet Note by incorporating the views that are to be received from the concerned Ministries and get it approved by MOC&IT before forwarding the same to the Cabinet Secretary. June 2015 issue of AIBSNLREA E-journal has been uploaded and is available under the link "E-Journal" in the left column. All the queries raised by Internal Finance of DoT have been replied by the Establishment Branch and reportedly no further queries have been raised by Internal Finance. Internal Finance of DoT had advised incorporation of certain corrections in the draft and the Establishment Branch is reported to have resubmitted the draft to the senior officers concerned after incorporating the required corrections. It can be now expected that the draft cabinet memo will soon be circulated for inter-ministrial consultations. The above issue was last discussed in the meeting of the Standing Committee of Voluntary Agencies on 03.02.2015 and the minutes of the meeting was also circulated by DOP&PW vide OM No. 42/39/2014-P&PW(G) dated 26.02.2015 wherein it was recorded that “Department of Telecom informed that since pay structure in BSNL and Central Govt. was different, the orders of Ministry of Health & Family Welfare regarding Ward entitlement on the basis of pay band/grade pay could not be made applicable in case of BSNL retirees. Ministry of Health and Family Welfare requested Department of Telecom to suggest alternate mechanism for the retirees of BSNL. Department of Telecom was advised to send a proposal to Ministry of Health and Family Welfare in this regard in a month’s time”. However till this date, DOT has not sent any alternate proposal to Ministry of Health & Family Welfare but a request has been made by Member (Services), Telecom Commission vide his DO No. 4-12(11)/2012-PAT dated 19.05.2015 to Addl. Secretary & DG(CGHS) requesting him to fix a date to discuss the above issue along with the case for extension of the CGHS benefit to the ITS Officers working on deputation in BSNL/MTNL. Modifying the form introduced a month back for filing income tax return for Assessment Year 2015-16, the finance ministry has decided to cut the number of pages in the form while keeping those clauses that will help it check tax evasion. In the new form, taxpayers won’t have to disclose details of all foreign travel undertaken and expenses incurred but they will have to give their passport numbers in the revised I-T return form. The taxpayers won’t have to mention the balances in their bank accounts but will have to disclose all their accounts, according to a finance ministry statement. The revised forms are yet to be uploaded in Income Tax department website. With the e-filing return forms expected to be released only by the third week of June, the government has also extended the last date for filing of returns to 31.8.2015 from 31.7.2015. Dhanbad (Jharkhand State) Branch of AIBSNLREA held its second Biennial Conference on 26th April 2015 at Hotel Vishram Lodge, Hirapur, Dhanbad. The meeting was presided over by Shri P Choudhury, Retired DE, Giridih. After other regular deliberations, election of new office bearers for the next term was conducted. Shri P Singh, Retd DE(M/W), Dhanbad was elected as the President of the Branch. S/Shri R Y N Parmar, Retd DE(Extl), Dhanbad and N Chakraborty, Retd DE(Admn), Dhanbad were elected as the Branch Secretary and Branch Financial Secretary of the Branch respectively. Contrary to the reports appearing here and there that the draft cabinet note stands cleared by Member (Finance), the note is still under examination in Internal Finance of DOT. In fact the file was last sent to Finance on 20.05.2015 by Establishment Branch clarifying an issue raised by Finance. The point on which Internal Finance has raised doubts is regarding the proposal to allow benefit of enhanced Gratuity, Commuted Value of Pension and Leave Encashment to those pensioners who retired between 1.1.2007 and 9.6.2013 which has been included in the present draft cabinet note. Incidentally, this part of the proposal was not agreed to by Department of Expenditure on the ground that IDA pensioners do not get any actual benefit of increase in pay/pension during the period between 1.1.2007 and 9.6.2013. However, there is no dispute on the question of pension-liability between BSNL and DOT as was being propagated by many to create some panic in the pensioners. Now Internal Finance is expected to take a final call on draft cabinet note to pave the way for its circulation. A report now says that ‘the government is set to launch a healthcare scheme for senior citizens as part of its social security initiative. Sources said the scheme would be funded through unclaimed deposits available with the government for which the law has already been amended as part of the budget exercise. The amendment will enable the government to tap a couple of thousand crores for the healthcare scheme. We will workout a threshold and people beyond that would be covered by the healthcare scheme, a source said. In the absence of access to government medical facilities, healthcare is seen as a crucial missing link for senior citizens who have to rely on family members to take care of them in old age.’ AIBSNLREA had earlier reported that the Government “has formed a Committee under Shri H R Khan, Deputy Governor, Reserve Bank of India to assess the amount of unclaimed deposits in PPF and Post Office Savings Schemes and also suggest steps for their utilization for the benefits of Senior Citizens. Other members of the Committee are Secretary, Department of Posts, Joint Secretary (Ministry of Law), Joint Secretary (Budget Division, Ministry of Finance), Deputy Managing Director, State Bank of India and Executive Director, Punjab National Bank. The Committee is to submit its report by 31.12.2014”. A General Body meeting of AIBSNLREA, Gujarat State Branch will be held on Monday, the 25th May 2015 at 15.00 Hours at the Amdavad Medical Association Hall, near Natraj Cinema, Ashram Road, Ahmedabad to discuss the latest developments on the pending issues concerning the BSNL Pensioners. The election of new Office Bearers will also be held. Dr. Amit Agrawal will grace the occasion as the Chief Guest. The meeting will be followed by Dinner. All the members are requested to attend the meeting. Allahabad Branch (UP State) of AIBSNLREA held a General Body meeting on 25.04.2015. The meeting was conducted under the chairmanship of Shri R.S. Gupta, Branch President. 25 members of the Branch participated in the meeting. 24 new life members have joined the Association taking the total membership strength of the Branch to 38………[Please read the full report in the “Uttar Pradesh” section of “State News” page of this website]. The quarterly General Body meeting of Lucknow Branch (UP State) of AIBSNLREA was held on 18.04.2015 in the Recreation Club at Kaiserbagh Telephone Exchange campus. The meeting was conducted under the chairmanship of Shri Jagdish Prasad, Branch President. 70 members were present in the meeting and 5 new Life Members joined the Association…… [Please read the full report in the “Uttar Pradesh” section of “State News” page of this website]. The draft Cabinet Note on revision of pension of pre-2007 BSNL pensioners and also those who retired between 1.1.2007 and 09.06.2013, following merger of 50% DA effectively amounting to 78.2% for fitment in revised IDA pay scales of the serving BSNL employees, is yet to be received back by Establishment Branch of DoT. The Note in file is reported to be still with Internal Finance Division of DOT. Amaravati Branch (Maharashtra State) of AIBSNLREA held a General Body Meeting on 03.05.2015 in the TRC Hall of Auto Exchange building under the president ship of Shri V P Agarwal. …. [Please read the full report in the “Maharashtra” section of “State News” page of this website]. Quarterly meeting of AIBSNLREA, Kolhapur Branch was held on 5th April 2015 in Telephone Bhavan Conference Hall with Shri L M Godi, President in the Chair. 56 members attended the meeting and 2 new members joined the Association. [Please read the full report in the “Maharashtra” section of “State News” page of this website]. A general body meeting of Ambala Branch of AIBSNLREA was held on 4.5.2015 under the chairmanship of Shri P.C Chauhan, President of the Branch and was attended by 27 members…… [Please read the full report in the “Haryana” section of “State News” page of this website]. May 2015 issue of AIBSNLREA E-journal has been uploaded and is available under the link "E-Journal" in the left column. Department of Pension & Pensioners’ Welfare, vide its OM No. 38/8/15-P&PW(A) dated 16.04.2015, has issued an Order stating that “…. The amount of additional pension as finally calculated may be rounded off to the next higher rupee”. It also orders that “In cases where pension/family pension of old pensioners has been fixed/revised without rounding off the additional pension, in those cases also, the additional pension be rounded off to the next higher rupee”. It may be recalled that it was AIBSNLREA which alone strongly took up the matter with BSNL and then with DOT at the time of revision of pension of pre-2007 BSNL pensioners in 2011 following revision of IDA pay scales for the serving BSNL employees w.e.f. 1.1.2007. In this connection, the posting dated 03.06.2011 in this website may be viewed. View the DOP&PW OM. A General Body meeting of AIBSNLREA, West Bengal State Branch was held at CTO Building, Kolkata on 13th April, 2015 with a mammoth gathering of more than 240 members. After a brief cultural Program, the deliberation started with Shri S.K.Maitra, President in the chair…… [Please read the full report in the “West Bengal” section in “State News” page of this website]. Department of Pension & Pensioners’ Welfare, vide its OM No. 1/19/2014-P&PW(E) dated 01.04.2015, has requested all pensioners’ Associations to assist the Government to get the Aadhar Number of the pensioners/family pensioners linked to their Pension Payment Orders (PPOs) and Pension Accounts. DOP&PW has said that “ A pensioner or family pensioner who wants to benefit from this (Aadhar based digital certificate) facility needs to get his/her Aadhar number linked to his/her Pension Payment Order (PPO) number and pension account. This will also speed up commencement of family pension in the event of death of pensioner or spouse.” DOP&PW has further advised the pensioners/family pensioners to visit the nearest NIC centers for the purpose. In this regard, posting dated 02.04.2015 on the same issue in this website may also be visited. View the DoP&PW O.M. A General Body meeting of AIBSNLREA, West Bengal State Branch will be held on Monday, the 13th April, 2015 at 13 hours at the auditorium of CTO, Kolkata to discuss the latest developments on the pending issues of the BSNL pensioners. General Secretary Sri S. Basu will address the meeting. All members are requested to attend the meeting. Establishment of Branch of DOT finally resubmitted the file containing the above proposal to its own Internal Finance replying to the various queries raised by it and providing all the information including the one for which DOT had only in last March asked BSNL to supply the same. It vindicates AIBSNLREA’s apprehension that DOT had unnecessary asked BSNL to supply such information which was already available with it [Read our editorial in April 2015 issue of e-journal]. Thus, one full month’s time has unnecessarily been wasted by DOT. This further confirms that some Officers in DOT are not seriously involving themselves in this important issue of the BSNL pensioners. Anyhow, the matter now is under scrutiny by Internal Finance and Member (F) has finally to approve the draft Cabinet Note in case Finance find it in order. Thereafter, the Note will be circulated among the concerned Ministries for their comments. Once their comments are received, the final Cabinet Note will be prepared by including these comments in the Note and submitted to MOC&IT for approval. Once approved, this will be sent to Cabinet Secretariat under the signature of DDG(Establishment), DOT. April 2015 issue of AIBSNLREA E-journal has been uploaded and is available under the link "E-Journal" in the left column. According to calculations based on All India Consumer Price Index for Industrial Workers, IDA is to be increased w.e.f. 1.4.2015 by 0.2% for CPSEs where last pay revision was implemented w.e.f. 1.1.2007 and by 0.5% where last pay revision was implemented w.e.f. 1.1.1997. Department of Telecommunication has since asked Bharat Sanchar Nigam Limited to provide the information regarding number of pre-2007 BSNL IDA pensioners and post 2007 BSNL IDA pensioners (cadre/grade wise) who retired between 01.01.2007 and 09.06.2013 vide its No. 40-13/2013-Pen(T) dated 13.03.2015. BSNL on its part, vide its No. 48-04/2015-Pen(B) dated 26.03.2015, has asked the Circles to furnish the same information to it. This is believed to be in connection with finalization of the draft Cabinet Note by DOT for revision of pension/family pension of the concerned pensioners/family pensioners. Thus, the circulation of Cabinet Note to the concerned Ministries will be further delayed. View the letters. AIBSNLREA had taken up with Secretary (Pension), Department of Pension & Pensioners’ Welfare the issue of inordinate delay in finalization of a disciplinary case against Shri Budheswar Mistry, Retired DE, Hazaribagh, Jharkhand Circle vide our letter No. AIBSNLREA/CHQ/2015/06 dated 15.03.2015 [View posting dated 16.03.2015 in this website for further details}. The Secretary (Pension) has now, vide his DO No. Secy/AR&PG/PG/2015/5856 dated 23.03.2015, has forwarded the said representation to Secretary (Telecom) and said that “You would agree that it is in the best interest of both, the organization and the employee concerned that the disciplinary case gets finalized early”. View the letter. BSNL Corporate Office is now considering the demand for restoration of medical allowance for outdoor treatment without voucher to the retired BSNL employees. In order to examine the issue, it has asked all CGMs to furnish some information vide its No. BSNL/Admn.I/15-22/14 dated 17.03.2015. View the letter. AIBSNLREA draws the attention of the Prime Minister of India on the unprecedented delay in extending the above benefit to the Group C Employees of DOT since absorbed in BSNL. It may be recollected that after series of representations on the above issue, DOT had sought for some information from BSNL to process the case at their end. BSNL Corporate Office had also asked the CGMs to furnish those information. In this regard posting dated 13.11.2014 and 02.12.2014 in this website may be viewed. However, the matter is still not resolved. View the letter. AIBSNLREA has now taken up the above case with Secretary (Pension), Department of Pension & Pensioners’ Welfare since BSNL and DOT are showing no interest to finalize the case though the IO had submitted his findings in December 2010. View the letter. AIBSNLREA has taken up the above issue with Prime Minister of India since numerous representations in the matter has failed to break the ice. The Association has requested for his personal intervention in resolving the issue citing some earlier Government decisions to resolve identical issue in cases of some PSU/Government employees. The Association also refers to its earlier representation vide its No. AIBSNLREA/CHQ/2014/24 dated 3.11.2014 (to read the letter, view posting dated 08.11.2014 in this website) addressed to Minister of State for (PP) on the same issue wherein the said Government decisions were quoted. View the letter. AIBSNLREA has written a letter to the Secretary (Pension), Department of Pension & Pensioners’ Welfare seeking for his intervention in the above case since BSNL Corporate Office has not been responding to repeated representations to resolve the issue. View the letter. March 2015 issue of AIBSNLREA E-journal has been uploaded and is available under the link "E-Journal" in the left column. AIBSNLREA had written to CGMT Tamilnadu Circle regarding a letter from CGM office dated 5.11.2014 to its Heads of SSAs authorizing the DGMs of the SSAs to sign permission letter to take treatment in nearby SSAs in absence of the GMs/PGMs to avoid delay. It had reproduced in the letter one particular Para of one BSNLMRS Order issued by Corporate Office in 2003. While, the revised annual limit for outdoor treatment with voucher for the serving employees has also been mentioned alongside the old provision by the Circle in its letter, this has not been done in case of the retired employees. AIBSNLREA had drawn the attention of the CGMT about this omission and requested to issue a corrigendum circulating the revised annual limit for the retired employees that was issued by BSNL Corporate Office in 2010 [Posting dated 18.11.2014 in this site may be viewed]. Tamilnadu CGM office has now issued a corrigendum reproducing extract from BSNL letter dated 8.9.2010. We are thankful to CGMT Tamilnadu Circle for issue of the corrigendum. View the Corrigendum. DOT had earlier conveyed the approval of Ministry of Health & Family Welfare to its proposal to allow the option to either avail the CGHS facilities or to continue with the BSNLMRS by the retired BSNL employees. BSNL, on its part, had also circulated the said Order of DOT. However, there was some problems being faced by the retired BSNL employees to get the CGHS facilities. The matter was last discussed in the 26th Meeting of SCOVA held on 03.02.2015 to sort out the issue. The relevant extract of the Minutes of the said meeting is reproduced below which indicates that DOT was finding it difficult to fix the rates of contribution and ward entitlement for the retired BSNL employees due to difference in the pay structure in BSNL and Central Government. 5 (XV) Sl No. 15 of ATR: Extension of CGHS facilities to retired BSNL employees – Issue of follow up orders by the Ministry of Health and Family Welfare & fixation of rates of contribution & ward entitlement by DOT:- Department of Telecom informed that since pay structure in BSNL and Central Govt. was different, the orders of Ministry of Health & Family Welfare regarding Ward entitlement on the basis of pay band/grade pay could not be made applicable in case of BSNL retirees. Ministry of Health and Family Welfare requested Department of Telecom to suggest alternate mechanism for the retirees of BSNL. Department of Telecom was advised to send a proposal to Ministry of Health and Family Welfare in this regard in a month’s time. 5 (VIII) Sl No. 8 of ATR:- Merger of 78.2% IDA with basic pension benefit to the absorbed BSNL pensioners: It was informed that the proposal has been approved by Department of Expenditure, in principle. Department of Telecom informed that as per the advice of the Department of Expenditure a Cabinet Note has been prepared and sent to their IFD for approval. Department of Telecom was advised to finalise the draft Cabinet Note and circulate it to the concerned Ministries by the end of February, 2015. 5 (VII) Sl No. 7 of ATR:- Anomaly in fixation of pension of DOT employees absorbed in BSNL, who retired between 1.10.2000 and 31.7.2001: It was informed that since the last SCOVA meeting, two meetings were held with the officials of Department of Telecom on 20.9.2014 and 30.12.2014 and Department of Telecom was advised to expedite the details/Reply sought in DoP&PW’s ID Note dtd 28.02.2014. Department of Telecom informed that the BSNL is collecting the requisite information sought by DoP&PW from corporate offices of BSNL/MTNL. Department of Telecom was advised to send a reply to DOP&PW within a fortnight. View the complete Minutes issued by DOP&PW. The draft Cabinet Note prepared by Establishment Branch of DOT and sent to its Internal Finance about a month back has since been received back in the Section two days ago with some queries raised by the Internal Finance. The Section is said to be now preparing the reply and the file containing the draft Note would again be sent to Internal Finance shortly. Department of Expenditure (Ministry of Finance) has since issued a circular letter dated 30.01.2015 in the background of some complaints being received that some banks are insisting for physical appearance of the pensioners/family pensioners at the time of submission of annual Life Certificate in the month of November every year. The Department of Expenditure has reiterated that physical appearance for the pensioners/family pensioners is not required if the Life Certificate is signed by any of the authority as already specified by it earlier. DOE has further clarified that Aadhar based Digital Life Certificate launched by the Prime Minister also does away with the need for physical appearance. View the circular letter. BSNL Corporate Office has again issued a reminder vide its No. 1-15/2011-PAT (BSNL) dated 03.02.2015 to all CGMs to supply the requisite information sought earlier vide its Nos. 1-15/2011-PAT (BSNL) dated 12.11.2014 and 01.12.2014 (Last posting on the same issue dated 02.12.2014 in this website may also be viewed). These information are required to be submitted to DOT for settlement of deferred option cases. February 2015 issue of AIBSNLREA E-journal has been uploaded and is available under the link "E-Journal" in the left column. Of late, some groups are making calls to the pensioners asking for the details of their Bank Accounts and even advising them to pay specified amounts in their specific Accounts promising them to pay huge money which are now said to be due to them but remained unpaid. Such calls were earlier being received promising to pay additional amount for LIC bonus. No one should respond to such calls, as these calls are aimed at to deceive the recipient of the calls. Do not divulge your bank account details, passwords of your mails etc to anyone. In order to publish information of local importance to various Branches, a new link "STATE NEWS" with sub-links to each state has been created and is available in the row above. The first news uploaded in this link happens to be from Maharashtra State . Branches are requested to send important developments/orders/news to the CHQ for publishing in the respective pages. General Body Meeting and Get Together of members of AIBSNLREA Chandigarh Branch will be held on 01-02-2015 (SUNDAY) at 12.30 HRS in SINDHI SWEET SCO 403 Sector 37D Market. Meeting will be followed by LUNCH. All members are requested to attend without fail. Bi-monthly meeting of AIBSNLREA Amaravati branch was held on 18th January 2015 in the Conferance Hall of O/o GMT Amaravati. Secretary welcomed all the members. All members were eager to know the status of pension revision due to merger of 50% DA effectively amounting to 78.2%. Secretary conveyed that the case is still pending in DOT as draft cabinet note has to be circulated among different ministries before submission for cabinet approval. Regarding reimbursement of medical expenses for outdoor treatment, bills pertaining to Maharashtra circle are being paid but those pertaining to WTR and WTP are still pending. Secretary along with two members has met DGM(Finance) twice and raised this issue. DGM (F) has assured to look into the issue. Secretary informed members that from February 2015 onwards BSNL will not issue land line/broad band bills to working and retired BSNL employees to encourage "Green Movement". Members may pay bills through net-banking or opt for ECS facility. Secretary also suggested that the members draw pension through joint account. The meeting felicitated four new members who have enrolled as life members. Meeting ended with vote of thanks. Gujarat State Branch of AIBSNLREA has recorded exactly 700 life membership strength and thus became the first State Branch to reach 700 mark. On the other hand, Maharashtra State Branch has now registered 610 Life Membership strength. Department of Pension & Pensioners’ Welfare has since circulated four new agenda items for discussion in the next meeting of SCOVA to be held on 3rd February 2015. However, the Action Taken Report (ATR) on the agenda items discussed in the last meeting has not yet been circulated. The ATR would have given us an opportunity to know the latest official status of two important items pertaining to the absorbed BSNL Pensioners. These items are (1) Anomaly in the fixation of pension of DOT employees absorbed in BSNL who retired between 1.10.2000 and 31.07.2001 and (2) Merger of 78.2% IDA with basic pension benefit to the absorbed BSNL pensioners. Quarterly meeting of Kolhapur Branch was held on 4th January 2015 in Telephone Bhavan Conference Hall under the Presidentship of Shri L M Godi, President. 58 members including 2 new members participated in the meeting. President wished all members a “Happy New Year 2015” and appreciated the enthusiasm of members in attending meetings and the Branch becoming more and more active. Then Shri D.K.Joshi, Secretary spoke on the “Pensioners Day on 17th December” being observed and mentioned about two Pensioners Com. D S Nakara and Satyapal Singh who were instrumental in obtaining Supreme Court's landmark Judgment in 1982 providing dearness relief to the pensioners. Then he informed the house about the latest developments and status in respect of the issues of revision of Pension with merger of 78.2% IDA for both pre&post 2007 BSNL Pensioners. He explained the continuous efforts by our GS, taking up the issue with PMO, MoC and others. He spoke about constitution of 3rd Pay revision committee, proposal of Digital Life Certificate based on Aadhar Card, expectations from the 26th SCOVA meeting to be held in February, increase in Medical Allowance to CG Employees from 300/- to 500/- per month and other issues pertaining to pensioners. Then Dr. Amith Sukre delivered a guest lecture on "Aurvedaachaarya” Sangli and gave useful information on “Spiritual Healing based on Adhyaatma & Science”. Then President of the Local Sr.Citizens' Association Shri. Chavan gave a valuable lecture on the Health and Social Service. Both the Guests were honored with bouquet & memento. The meeting conculded with vote of thanks by Shri SG Kanade. Bi-annual meeting of AIBSNLREA Nagpur was held on 11th January,2015 at Amenity Block,CTO Compound Nagpur under the Chairmanship of Shri N G Talewar President of the Branch. After paying tributes to the departed family members, Shri U B Nikose Vice President welcomed all members in the first meeting in the New year 2015. Shri N G Talewar briefed the house regarding the efforts being taken by CHQ to meet the expectation of the BSNL pensioners. Shri P R Bhujbal Branch Secretary highlighted the status of long pending issues, and other important issues being taken up by CHQ. Various correspondences made by CHQ over the inordinate delay in allowing the benefit of 78.2% IDA merger with basic pay as on 1-1-2007 to the BSNL pensioners retired during 1-10-2000 to 9-6-2013 were briefed to the house. Other issues viz. unending delay in settlement of pending disciplinary/vigilance cases against the pensioners, ensuring timely and expeditious settlement of the pension cases of the BSNL retirees, Pension liability in r/o the DOT employees retired prior to 1-10-2000 in CDA scale, Memorandum on pensionary benefits and related issues submitted by CHQ to 7th CPC, Income Tax exemptions in union budget 2014-15 and Aadhaar based digital life certificate for the pensioners were fully explained to the members. Meeting was attended by members in large numbers. Twelve BSNL retired executives joined the association and enrolled as life members of AIBSNLREA. House congratulated all the newly enrolled life members. Meeting concluded with vote of thanks by Shri N R Rachkondawar Asst Secretary. Shri U B Nikose, Shri Arun Deshpande and Shri Bhola Kamble took efforts for the grand success of the meeting. East Vidarbha (Nagpur) Branch of AIBSNLREA is to hold its bi-annual General Body Meeting at 4.00 PM on Sunday, the 11th January 2015. The venue of the meeting is Amenity Hall, CTO Compound, Nagpur. All the members of the Branch and other retired Executives have been invited to attend the meeting. Shri P R Bhujbal, Branch Secretary may be contacted for further details on his mobile No. 9422810810. January 2015 issue of AIBSNLREA E-journal has been uploaded and is available under the link "E-Journal" in the left column. Department of Pension & Pensioners’ Welfare has since notified that the 26th Meeting of SCOVA will be held on 3rd February 2015. However the venue of holding of the meeting is yet to be announced. The agenda to be discussed in the next meeting along with Action Taken Report on old items are also not yet circulated.